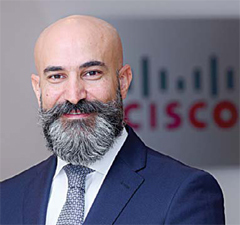 DUBAI: Cisco Middle East has announced that Shukri Eid has been appointed Managing Director of its East Region effective immediately. In his new role, Shukri will lead the Cisco’s business in the UAE, Oman, Pakistan, Afghanistan and Yemen and work closely with partners to support private and public sector customers in their efforts to digitize and transform their operations. Shukri is a Cisco veteran of nearly 10 years and has worked in multiple leadership capacities across the organization. A Cisco Leadership Pipeline Program alumnus, Shukri most recently held the position of Senior Director of Country Digitization Acceleration (CDA) in Cisco’s EMEAR region, working with government and industry leaders to accelerate national digitization strategies. Prior to that he was the Director managing Cisco Consulting Services in the same region, where he led a team advising large customer organizations across public sector and enterprise as well as telecom service providers.